Q? A reader wrote about a worst-case scenario that happened last summer to their cancelled reunion: the hotel held them responsible for their commitment, which was very costly. To learn from the cautionary tale, we turned to Dean Miller, National Sales Manager at Visit Fairfax in McLean, Virginia, for his take on this question. We had a family reunion plan for this year but due to the economy, a large part of the family in the South cancelled. Because we were under contract with the hotel for rooms and catering we couldn’t fulfill our obligation and had to cancel. By cancelling we owed the hotel 60% of the bill. We negotiated it down to half of the bill, but that was still a lot of money to lose. A! 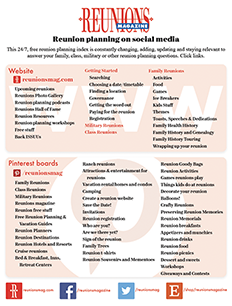 In the current economic downturn, some reunions have had to scale back—or cancel—their reunions. For groups who have signed contracts with hotels or other venues, this can be particularly challenging. In this situation, the planner’s first call should be to the hotel, to the sales representative who negotiated the contract. Explain that the group would like to postpone—not cancel—their reunion, even if the new reunion date is a year or more in the future. Hotels would much rather work with you to reach an accommodation on new dates than to lose your business completely. As an incentive to the hotel to grant the postponement, you may wish to offer to spend more money with the hotel over the new reunion dates. Offer to schedule an additonal meal function (such as a group breakfast), or to pay a slightly higher guest room rate, or to give back a previously negotiated “perk” (such as a complimentary suite or meeting room). Or ask what new reunion dates the hotel would like the reunions to help fill. If the reunion can help fill dates when the hotel would otherwise experience low occupancy, the hotel may be willing to accommodate the new dates without any additional charge at all! If the hotel is unwilling to accommodate the postponement, the planner should notify family members of the pro-rated charge they would each incur for cancelling the reunion. When they get this news, they may decide to come to the reunion after all! For example, if 50 families planned to attend and the cancellation charge was $10,000.00, having to pay $ 200.00 per family may encourage everyone to get together anyway. Better to spend the money to attend the reunion than to spend the money and get nothing at all for it! If the hotel is still unyielding, try (as was the case here) to negotiate the hotel down on the amount of money owed as a cancellation penalty. The good news is that you can still ask the hotel to apply this amount as a deposit toward a future reunion, scheduled within a defined period of time. In such negotiations, it is very helpful to request a face-to-face meeting with both the sales representative AND the hotel’s General Manager, as the General Manager will have greater authority to negotiate an agreeable settlement. This situation clearly underlines the importance of reunion planners taking these three steps IN ADVANCE. 1) Ask family members for an advance deposit prior to signing any contracts. People are FAR less likely to cancel out of an event if it means the loss of a pre-paid deposit. 2) Conservatively estimate the number of guest rooms and other hotel services (banquets, etc.) you are likely to use. If your numbers increase, the hotel will be delighted to accommodate a greater number; if the event shrinks, there will likely be financial penalties, as this planner discovered the hard way. 3) Negotiate the least onerous cancellation and attrition penalties possible with the hotel PRIOR to signing the contract. Reducing or eliminating the standard cancellation and attrition penalties in a contract is something that many hotels will do, but only if asked. Next Article Hail the pre-con meeting!